1. I had 15 months to plan and there were still a few things that could've been structured a bit better. You need more time than you think to plan. Start planning as early as possible and enlist trusted help if you can. Make sure your bridesmaids are going to be people who are excited for you, want to help you plan, and will be a calming presence on the day. 2. 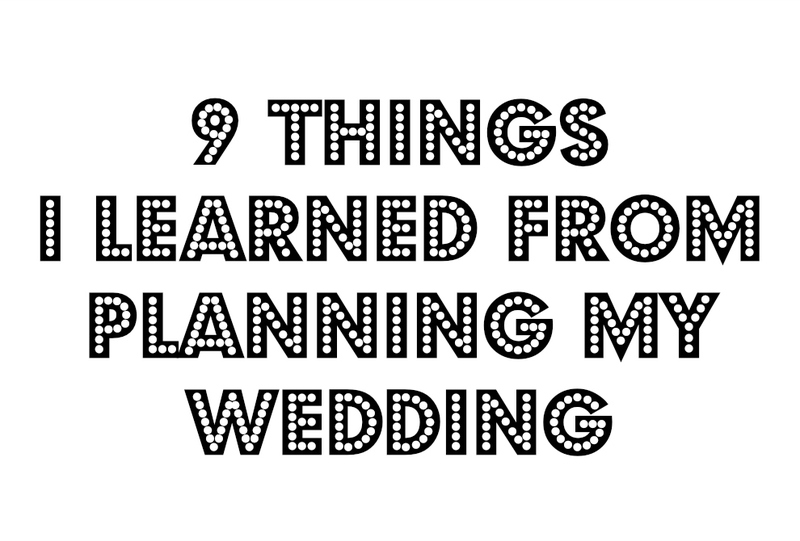 However much time you think you need to get ready on the morning of the wedding, add more. I got up 4 and a half hours before the wedding and I really could've done with another hour. When I arrived at the registry office I was sweaty, pretty much entirely make up free, dying of thirst, and LATE. I'd barely had a drink all morning and the only food I'd had had been hand-fed to me by the bridesmaids while I did something else. Work out how long you need to get ready on the day and add 30-60 minutes for the unknown. The worst case scenario is you get more time to beautify yourself or be primped by your hairdresser/make up artist. 3. Although you might be tempted to have your family around you as you're getting ready, as I did, it's a massive distraction. 20 minutes before I was due at the registry office I was in my underwear. No dress, no make up on, no shoes on and a million thoughts dancing around my head because everyone was asking me questions simultaneously. I had literally 30 seconds to swipe some eye shadow and lipstick on before I ran out of the door. Get ready with as few people as possible present on the big day. The more people you have around you the easier it will be for things will get out of control. There was so much unnecessary stress I caused myself by having too many people in the house. 4. It goes so quickly. Everyone told me this but it really does. The importance of the photographer really comes in because you'll use the photos as a memory aid. Don't be afraid to ask your guests for (digital) copies of their photos. It costs nothing, and on the day you're so busy being social and in love, you can't be everywhere at once. Take the opportunity to get together with friends and family to talk about things from their perspective. It really enriches the experience for everyone and prolongs the joy. Send a 'round robin' email asking guests if they have any photos they wouldn't mind sending you, or even better, pay them a visit! We're going visiting next weekend to chat with everyone and to see if we can snag some photos. 5. Make sure your dress is the best you can get for your budget. Do your research, ask around, visit bridal shops if that's your thing. As a plus size bride I knew bridal shops would be a soul-destroying experience for me, so I bought my dress online. My dress was very inexpensive, but the experience was rather stressful coming up towards the wedding as I only received it 4 or 5 days beforehand. Despite the worry I was lucky, because my dress was absolutely beautiful and most important of all, wonderfully flattering! When we thought my dress wasn't going to come, we immediately knew how miserable I'd be in the 'wrong' dress. If we'd had to, we would've searched the country for the right dress, money no object, even if it got us into debt. Set a budget for your dream dress, then do your research to get the best you possibly can for that amount. A bride HAS to feel beautiful and confident and if the dress is wrong, it'd be just awful. 6. Make sure your venue is the best you can get for your budget. I had initially crossed our wedding venue off the list as I (wrongly) assumed it'd be ludicrously expensive. It turned out to be very reasonable and EVERYONE loved the food, the building and the service we got from the staff. Half of our budget went on the venue and the food and it was worth every single penny. Check out all the venues on your list, even the ones you assume might be out of your league financially. You might get a pleasant surprise! Ultimately, there is no monetary amount you can put to seeing your loved ones enjoying the day just as much as you are. It's priceless. 7. Always go with your gut feeling. We cancelled our original venue as the owner was odious and clearly only interested in making a buck. I had an uneasy feeling about him from the start, and we were lucky that a change in circumstances meant we had to cancel. Even though we lost money we made the right decision. From the very first meeting with the final venue we went with I felt reassured and we fell in love with the venue. Trust your gut. If something feels 'wrong' and if you can tell someone wants to screw you for every penny they can get, don't touch them with a barge pole! If you're paying someone thousands of pounds they need to be serving your interests first, not theirs. 8. Lean on your bridesmaids and best man on the day. Everything will go crazy on the day and you'll need them to look after some of the details. My BMs had my glasses, phone etc. The photographer had a calming effect on me. When me and my new HUSBAND (sorry, I couldn't resist!) went back to the hotel for a rest in the afternoon, we came back to find our bridesmaids had decorated the cake and laid out the table decorations for the evening buffet. It was a lovely surprise and a weight off my mind. Surround yourself with people you love and trust and your day will be infinitely less stressful. As long as you have planned everything thoroughly, the day will go great. Just trust it will be OK. It'll be better than OK! It'll be the sum of all your highest hopes and dreams put together, amplified by a thousand. Relax, you've done the hard part. Smile, enjoy looking beautiful and bask in the love of your partner. See how much love there is in the room for you. Soak it all up, it's beautiful. It really WILL be the best day of your life thus far.